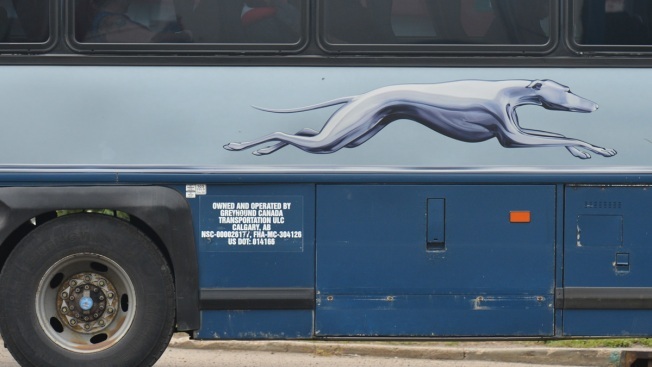 This Sept. 11, 2018, file photo shows a Greyhound bus logo. Mohanad Elshieky, a 27-year-old comedian and asylum-seeker traveling home to Oregon after a performance in Washington state, was ordered off a Greyhound bus by immigration agents and detained — even though he is in the country legally, NBC News reported. After removing him from the bus, the officers asked for his identification, Elshieky recalled. He said he told them he had a driver’s license from Oregon and a valid work authorization card — a document issued by U.S Citizenship and Immigration Services that refugees and other immigrants can show to employers. Elshieky said he came to the United States on a visa for exchange students in 2014. Later that year, as civil war gripped his hometown of Benghazi, Libya — and threatened him personally — he applied for asylum, he said. In October 2018, his application was accepted, according to documents viewed NBC News. Through a spokesman, Customs and Border Protection described the incident as a misunderstanding and said Elshieky did not have the proper paperwork on him at the time, noting that Elshieky’s asylum documents “would have worked to resolve this inquiry quickly."